The Magis Center aims to live the call of the Catholic saint and founder of the Jesuit order, Ignatius of Loyola, to do everything for the "greater glory of God." “What decision would benefit not only me, but the whole community?" The educational vision of the Sisters of Notre Dame attempts to answer this question by preparing young women to become self-confident leaders in service in our local community and also for the global community. Recognizing that every moment counts and that every decision is an opportunity to love, how do we make decisions that embrace the greater good of the larger community? The Service Learning and Leadership program strives to provide students with service and leadership opportunities that will engage and prepare them to use their talents in service to others. Whether serving meals to the homeless or leading a Friendship Week rally, our students dedicate hours in service to their peers and their community. La Reina nurtures servant leadership, preparing Regents to transform the world into a more just, loving, and inclusive place. Below is information on several of the on-going and recurring programs we run at La Reina, but service opportunities abound throughout a student's time here. For more information about this program, please contact our Dean of Students Ms. Emily Beutner. La Reina has participated in the Adopt-A Family Program through the Archdiocese of Los Angeles since the early 2000's. We have participated in this type of giving program during the Christmas season since the 1980s. 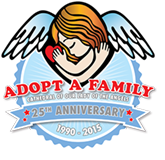 Adopt-A-Family was started by Msgr. Terence Fleming and is run through Our Lady of the Angels Cathedral. The program services over 300 families every year on Skid Row, and throughout the downtown LA area. Each Religion class, grade 6-12, receives a family profile, a snapshot view of the family’s living conditions, family members, and a gift wish list. In 2017, we adopted 17 families and the gifts are driven to Los Angeles in early December and distributed on Delivery Day the week before Christmas. We typically send about 10 students to Delivery Day as part of Team Fleming - the group of volunteers who load the gifts into cars to be delivered. Hundreds of Delivery Angels from across the Archdiocese come to the cathedral as Team Fleming loads the gifts, food box, and directions and the gifts are on their way to the families! La Reina families are encouraged to participate (in large vehicles, if possible) to actually deliver gifts as a family if they’d like. In fulfillment of the mission of the Sisters of Notre Dame and the philosophy of La Reina High School & Middle School, a designated number of Community Service hours are required of all students. This service is to be completed in the larger community, giving the student an opportunity to share her gifts beyond the school. Failure to complete the yearly service requirement will result in the student receiving an “Incomplete” in her religion course for the second semester. The student then has until the beginning of the following school year to fulfill the requirement. If the student does not complete her obligation by this time, her second semester religion grade will be lowered by one letter grade. A senior must complete the yearly service program requirement in order to graduate. The diploma will be held until the total requirement has been met and verified. The final transcript will indicate that the student has officially graduated when the requirement has been met. If you need help finding a service site or with any other aspect of the Community Service program, please email Director of Service Learning & Leadership Mrs. Emily Beutner or check this list of organizations with which La Reina girls have worked in the past. Students submit their service hours for approval and recording via the x2VOL feature of their Naviance Family Connection. x2VOL will keep track of service hours for a student’s career at La Reina, giving her a valuable record of her service when applying for scholarships and college. x2VOL also allows students to learn about upcoming service opportunities and sign up for them right from their Family Connection Page. Students will receive email reminders about events for which they have volunteered as the dates approach. When completing their service, students should be sure to request the email addresses of their supervisors as x2VOL requires an email address to verify service hours. Each month, Student Council’s Outreach Committee selects a cause to support through a Free Dress Fundraiser. Students have the opportunity to wear free dress by participating in the month’s selected donation or activity. As freshmen start their high school experience together, it is important that that they have intentional time to grow closer as a class, to recognize and develop their own leadership potential, and to reflect on their responsibilities not only to each other but also to the larger community. With these goals in mind, La Reina organizes the Freshman Day of Service in the early weeks of the school year. The day consists of a morning service outing, lunch and prayer at the Notre Dame Center, and leadership activities back on campus. Throughout the day, students gain a better understanding of the concept of “Magis”- reflecting on how they can serve the greater good in the larger community and on campus through their unique leadership skills. During each Kairos retreat, it is a requirement that all Seniors who are not on retreat participate in the Senior Service Experience with her classmates at various locations. This program is a graduation requirement. Senior Service Learning is a theme-based, three-day service experience that helps students to deeply think about the needs of our community. For the past three years, Senior Service Learning has focused on addressing food insecurity in our community. Students have an opportunity to pick food to be donated, to work in a distribution center or food pantry, and to serve a meal. Students are able to see food from farm to table to better understand how many people are required to make sure no one in our community goes hungry. The topic sparks meaningful connections with their various courses from religion to anatomy, from economics to Spanish, from psychology to government, encouraging students to consider how their interests and strengths can be used for the greater good as they move on to college and careers. These service activities are reflective of the Catholic identity of La Reina High School that emphasizes “a proactive policy regarding issues of justice, peace and integrity of creation” and a service program that is a natural outgrowth of the school’s religious education program. The girls will, according to each one’s schedule, expand their understanding of and empathy for our brothers and sisters who may not be as fortunate as we are. Questions about service hours, requirements, and approvals should be directed to Mrs. Emily Beutner, Director of Service Learning & Leadership. One of the beautiful gifts we have on this campus is the ability to come together as community to pray! On average, we take one day a month to stop our routines, and to gather as a united school community to acknowledge and thank our good God. Each year, a team of dedicated students train to assume various roles during the liturgies. Along with the God Lead Singers, we work hard to create an upbeat spiritual atmosphere in which to praise God! All are welcome to attend our masses. Please check the calendar for the specific date each month. Students of all grade levels are invited to participate in liturgy planning, preparation and leadership roles. God Lead Singers is the resident Christian Contemporary music group. They lead campus liturgies in song and appear in events off-campus. This is a highly-competitive, audition-only group. Auditions are held in May each year for the following year. Membership commitment is for a one-year term. Singers must re-audition annually. There are six members of this group (with additional alternates). Those selected for this group have their name/year(s) embroidered on one of the robes. Their legacy of spirituality through music lasts long after graduation. Singers must be advanced-level musicians and have a clear commitment to ALL rehearsals and engagements. Most importantly, students must demonstrate the desire for deepening their faith through music and fellowship. For more information about worship opportunities, please contact our Liturgy Coordinator, Allison Sain '85. Retreats offer our students a moment to step aside from the constant movement of the everyday and to pause, enjoy, and breathe. So often, our hearts and minds are consumed by the happenings of the past or concerns for the future, and we miss the beauty, insight, and grace of the present moment. Our retreat program offers an opportunity either as a one-day, over-night or 3-night experience for La Reina students to connect more fully with themselves, their community, and their God. Each retreat offers times for community building and fun, personal reflection and prayer, and creative expression. Each retreat is also prepared and led by a team of peer leaders who meet for several weeks prior to the retreat to design a unique and meaningful experience for the class they are preparing to serve. Our greatest hope is that young women will emerge as strong, confident, reflective, and empathetic leaders who, through the use of their own gifts, will ultimately glorify God by creating a better world. The Freshman Retreat concentrates on the theme of new beginnings and friendship as the students begin high school. These retreats emphasize the importance of nurturing their relationship with God and the gift of friendship with their fellow classmates. The day offers opportunities for class bonding and personal reflection. The Sophomore Retreat is a one-day retreat that invites students to reflect on their individual gifts and how they can use them in service to the wider community. The Junior Retreat is an overnight experience that invites students to examine and assess their lives and their understanding of God’s call to them. It is a retreat of personal renewal and of growth as a faith community with their classmates while enjoying a beautiful outdoor setting. The Senior Kairos Retreat is a four day retreat that students may choose to attend either in the fall or the spring. Students will consider what God has gifted them in their lives and invites them to accept themselves as loved unconditionally by God. Kairos is a Greek word meaning “special time.” and during this “special time” retreatants will be looking carefully at themselves, their relationships with others, and their relationships with God. Kairos attempts to evoke in its participants a dynamic, personal sense of God. It is a beautiful gift for young people. Many of our past retreatants say that they were so affected by the experience, that their relationships with family, friends, and even themselves were enhanced for good. All Sophomore, Junior, and Senior students are invited to apply to prepare and lead the high school retreats. If you are interested in participating please email Ms. Theresa Thibodeaux. Applications for the next school year will be available online in early August. Retreat Leader Training Day: All Retreat Leaders are asked to attend a half-day leadership training before they begin preparation for individual class retreats.